Now it is time to prepare the bike and the biker for the new 2012 season. We all look forward to the new experiences which are laying ahead of us. Before we start the season, the motorcycle needs to be looked after and we need to plan our tours. This is what I will write a bit about in this TourNews. The winter is a good time fore planning the comming motorcycle tours and become aquianted with the GPS - Garmin, TomTom and Navigon. Further, you will learn hos to make a motorcycle ride plan. This is why I had held 40 GPS evenings around Denmark demonstrating Tourstart and the functions and had some working sessions with the users. Normally we have been around 20-50 at each event. All the participants have worked with a great enthusiasm and planned a lot of tours. It has been a pleasure to visit the dealers and motorcycle clubs, and I hope to have some events next winter as well. 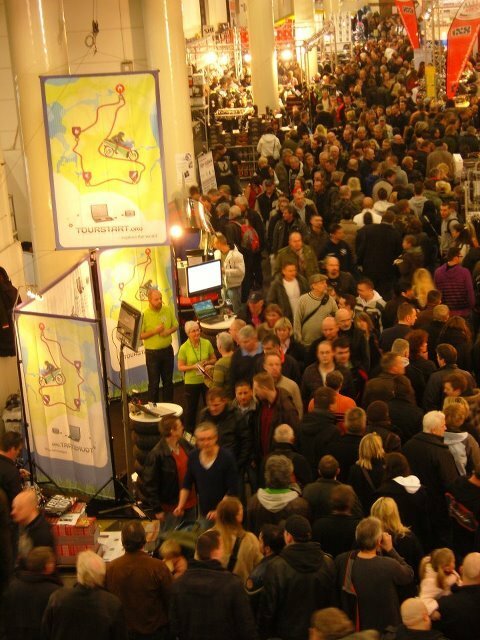 It was a fantastic experience to exhibit in Hamburg in January, where the German motorcyclists very positively welcomed Tourstart. We had a lot of visitors on our booth, and even HMT are so excited about the functions on Tourstart that they use it on their web site to plan a great motorcycle route to the show. Using the embedd function on www.tourstart.org/drive you can do the same - free of charge. Now it is time to prepare the motorcycle for the new season. The good advices are from www.larsenmotorcykler.dk who is a leading Suzuki dealer. They are very busy preparing their customers motorcycle, but never too busy giving some good advices. You need to assure the brakes are not stock during the witer, and the brake pads have enough lining and futher to this, check the brake disks are not worn our. Check the tyres are in a good condition and you have sufficiens thread pattern and air pressure. A good saying about tyres: Having any doubt - exchange them. It is a major player in regards to driving safety. A well lubricated chain is a good chain. Some of you might have a shaft drive, so be happy that you avoid greasy fingers when cleaning the chain. To the rest of you - check all chain links are moving freely and then adjust the chain. Then you only needs to lube well before this item is checked and done. It is pretty important to keep an eye on the oil and filter exchange interval, so the engine gets fresh oil as presibed. Even the oil is expensive - and will continue getting more and more expensive - it is still the least part of the running cost owing a motorcycle. Remember, it is the oil which keeps your engine in a good condition. I wish you all a great start of the new 2012 motorcycle season.